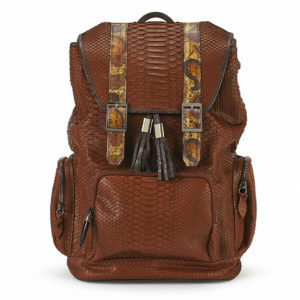 Materials: Genuine embossed tan leather, one zippered pocket, two open pockets, Lampo zippers. 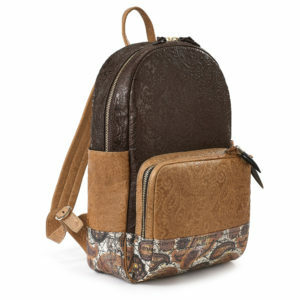 Interior: genuine pig suede, one open pocket. 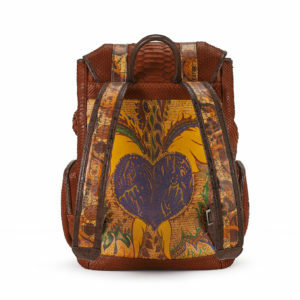 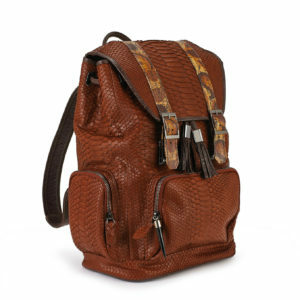 Materials: Genuine embossed tan leather, brown embossed leather pockets, one zippered pocket, two open pockets, Lampo zippers. 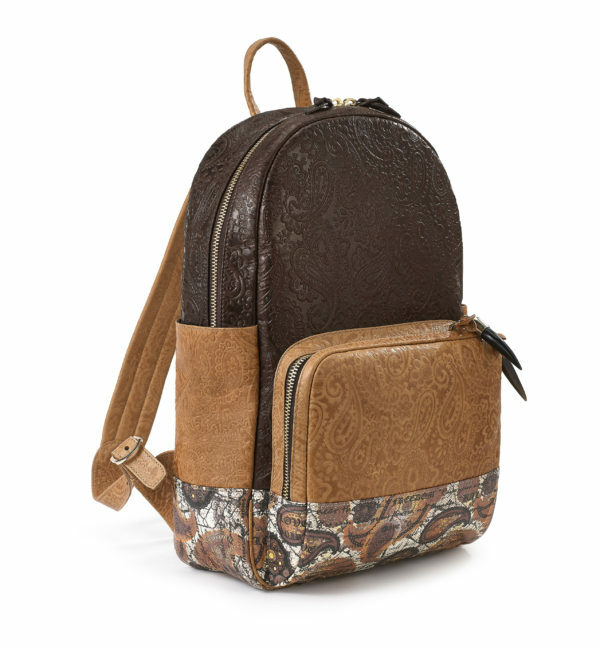 Interior: genuine pig suede, one open pocket. 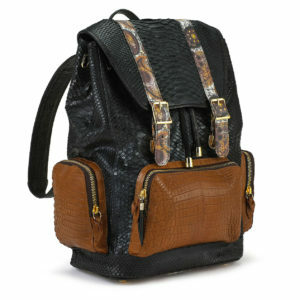 Materials: Genuine black embossed leather, one zippered pocket, two open pockets, Lampo zippers. 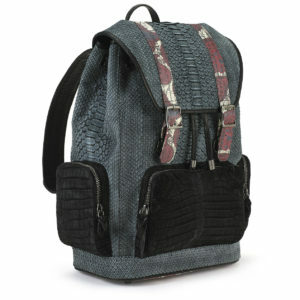 Interior: Genuine pig suede, one open pocket. 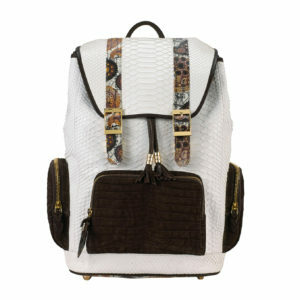 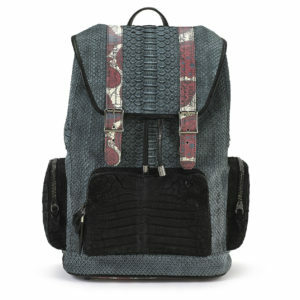 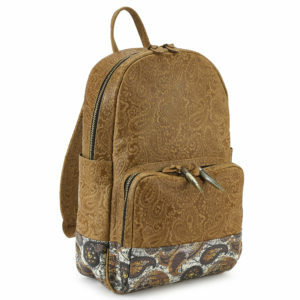 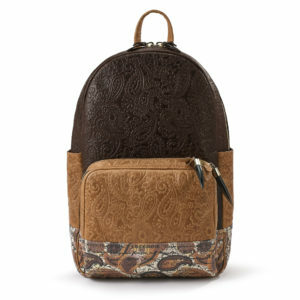 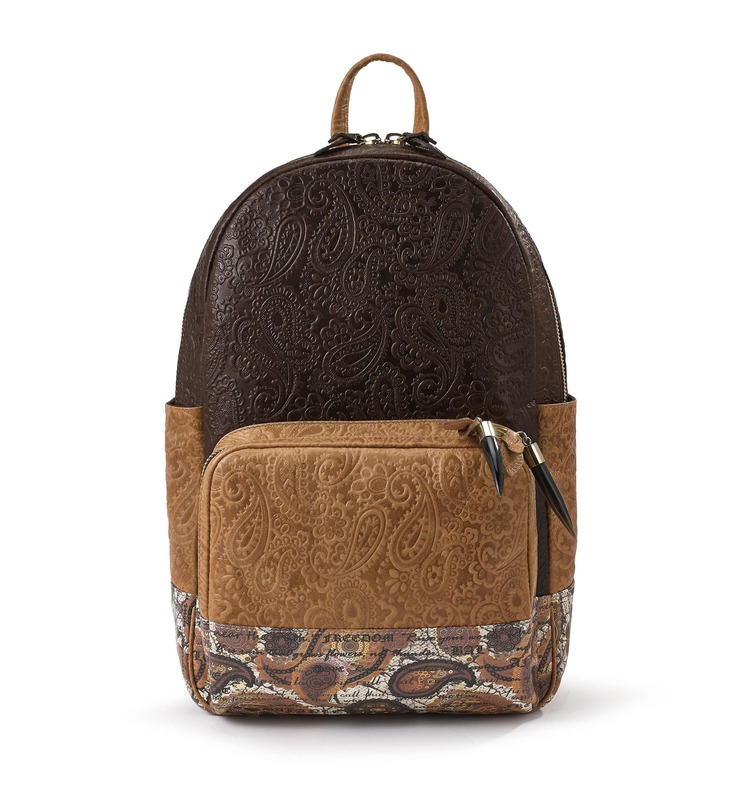 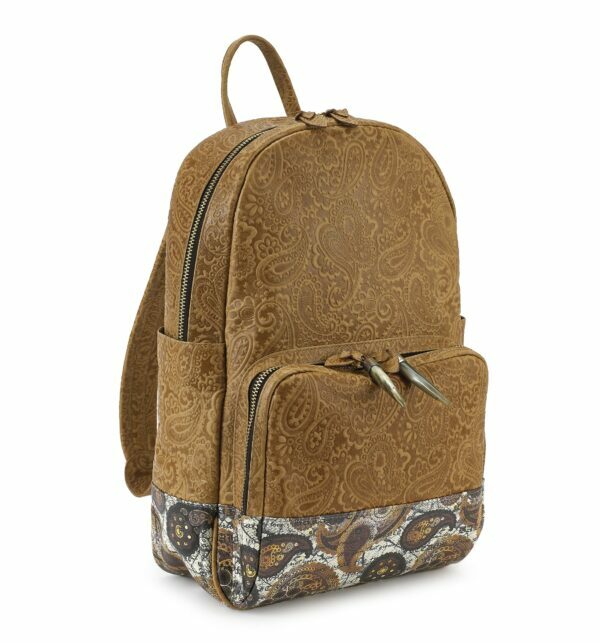 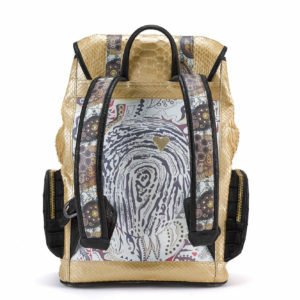 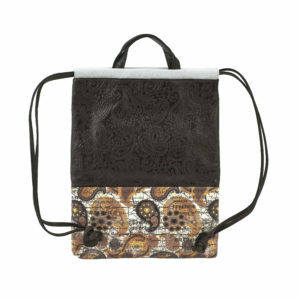 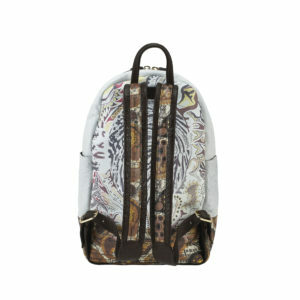 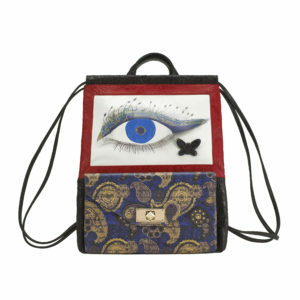 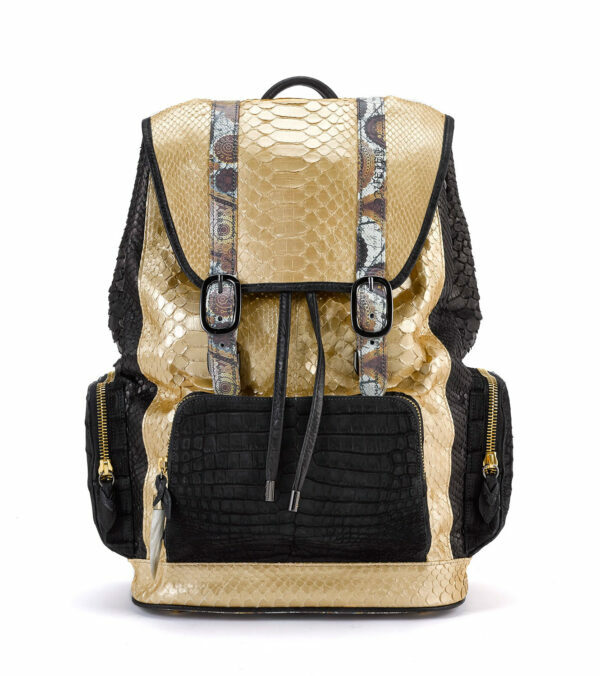 Materials: Exotic Gold python, Lampo zippers, Gunmetal and gold tone hardware. 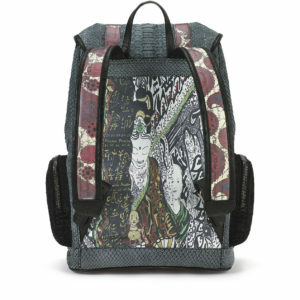 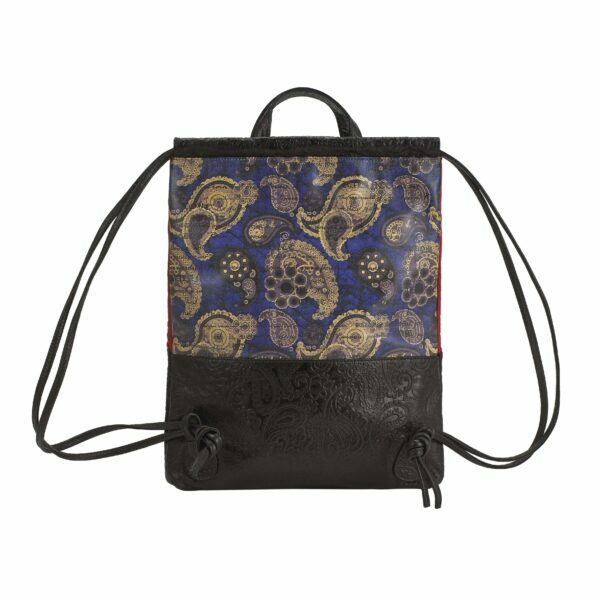 Interior genuine suede, two interior pockets, zippered pocket, key holder, laptop pocket. 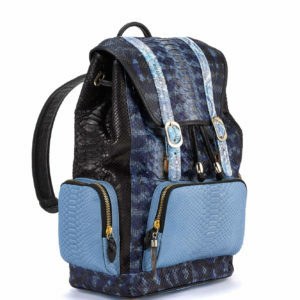 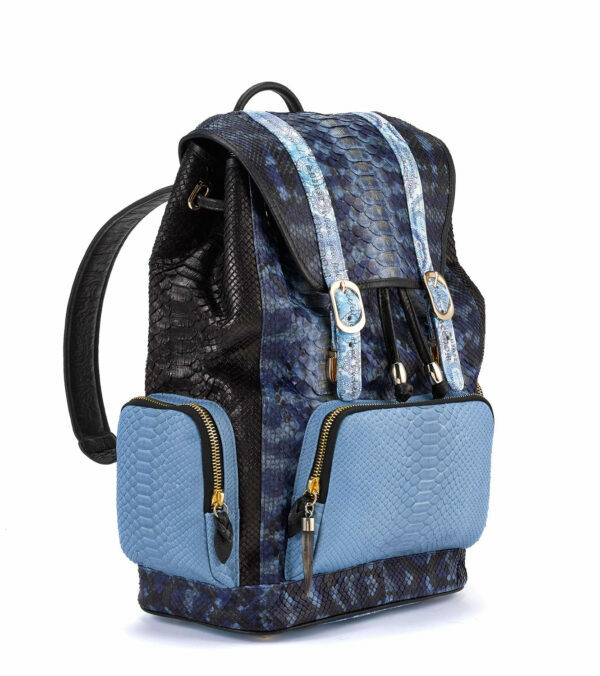 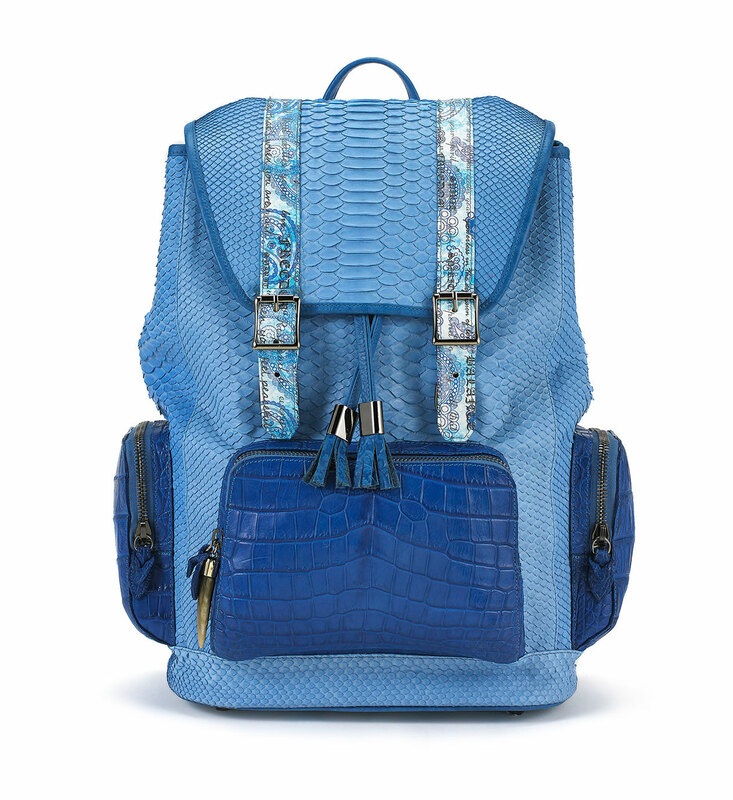 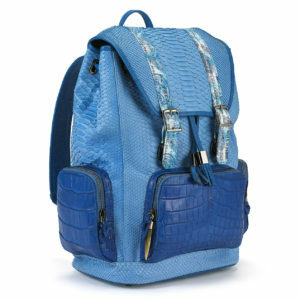 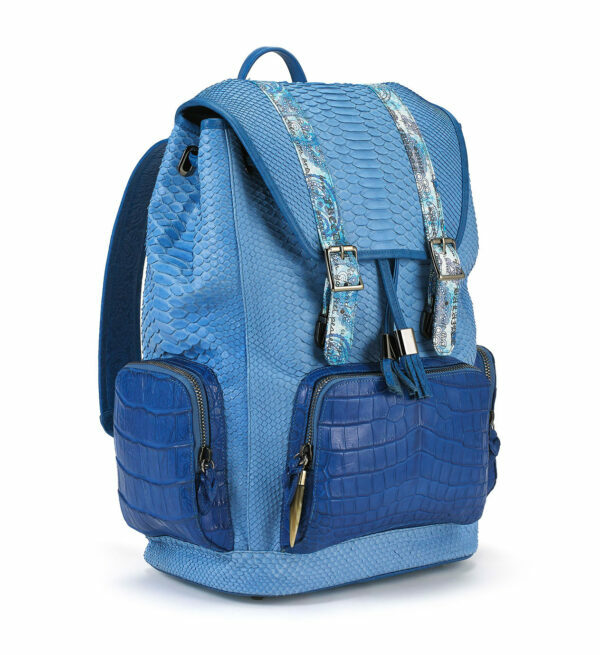 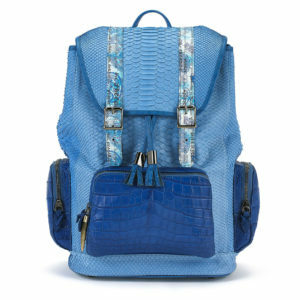 Materials: Exotic Blue Python Skin Exterior, Blue Crocodile Pockets, Lampo Zippers, Genuine Suede Interior, Two Interior Open Pockets, One Zippered Pocket, Tablet Compartment, Key Holder, Mini Horn Pull, Gunmetal Hardware. 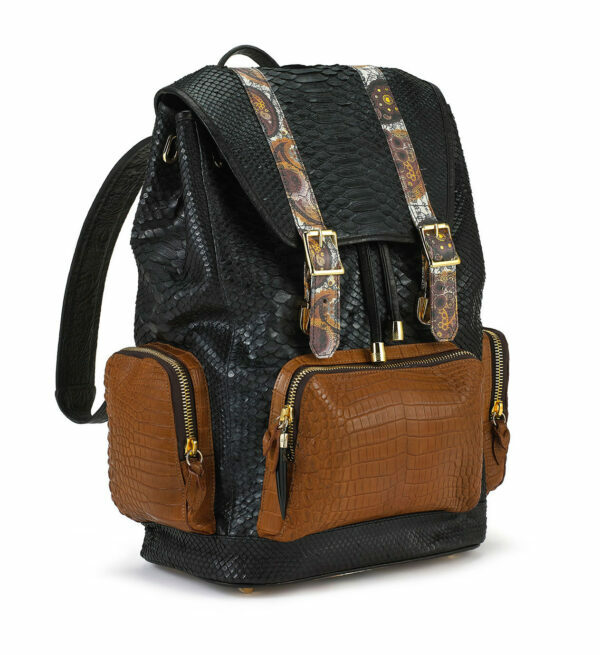 Materials: Exotic Black Python Skin Exterior, Cognac Crocodile Exterior Pockets, Lampo Zippers, Genuine Suede Interior, Interior Open Pockets, Zippered Pocket, Tablet Compartment, Key Holder, Mini Horn Pull, Gold Hardware. 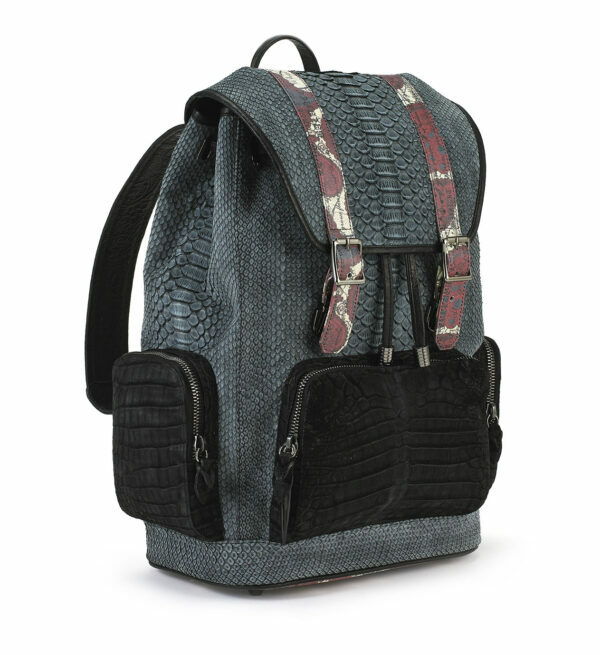 Materials: Gray exotic python skin exterior, black crocodile pockets, lampo zippers, genuine suede interior, two interior open pockets, one zippered pocket, tablet compartment, key holder, mini horn pull, gunmetal hardware. 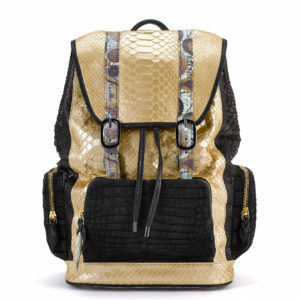 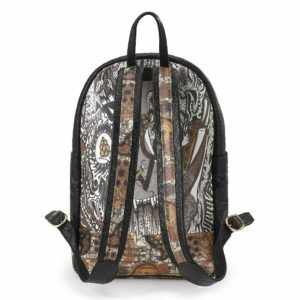 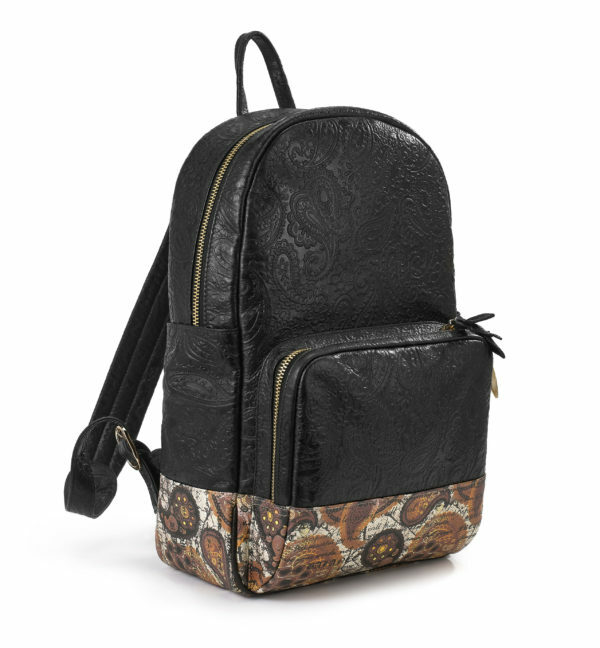 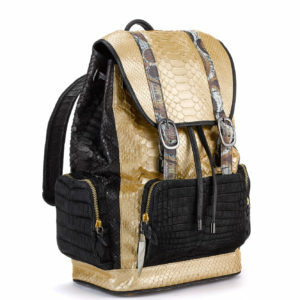 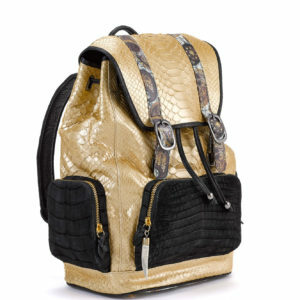 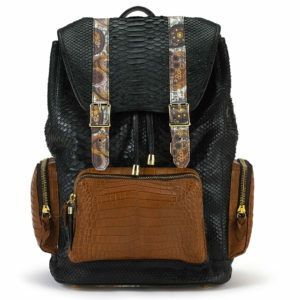 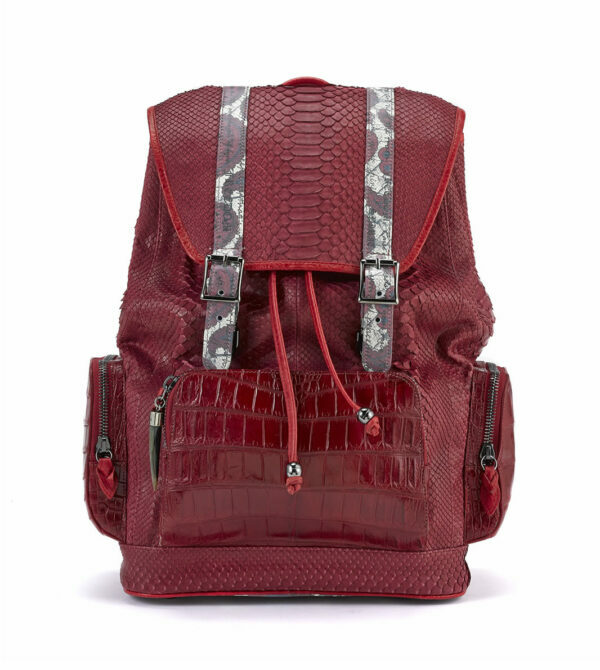 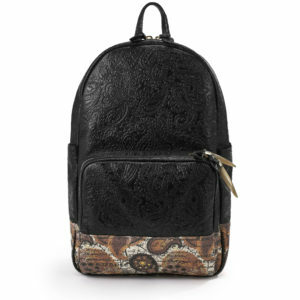 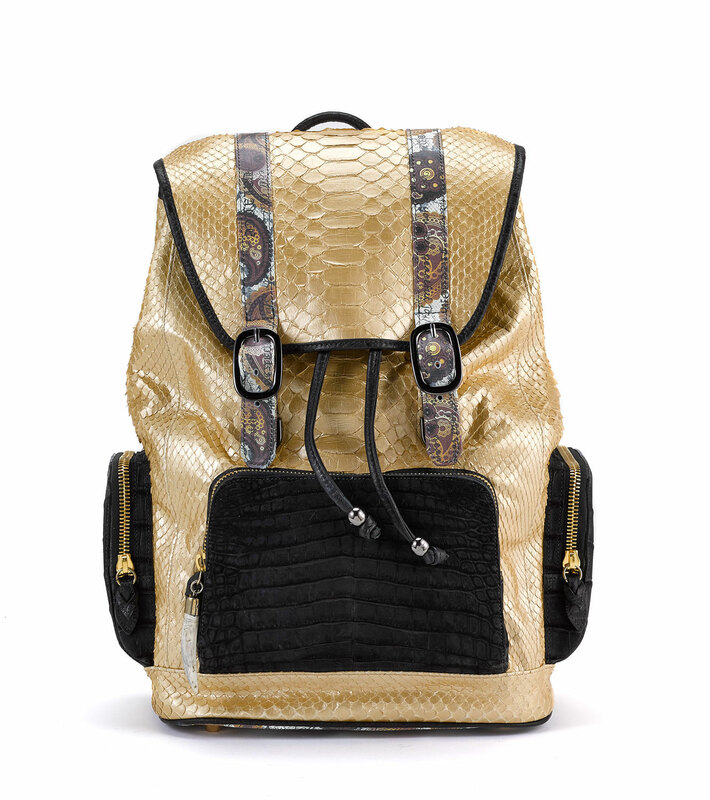 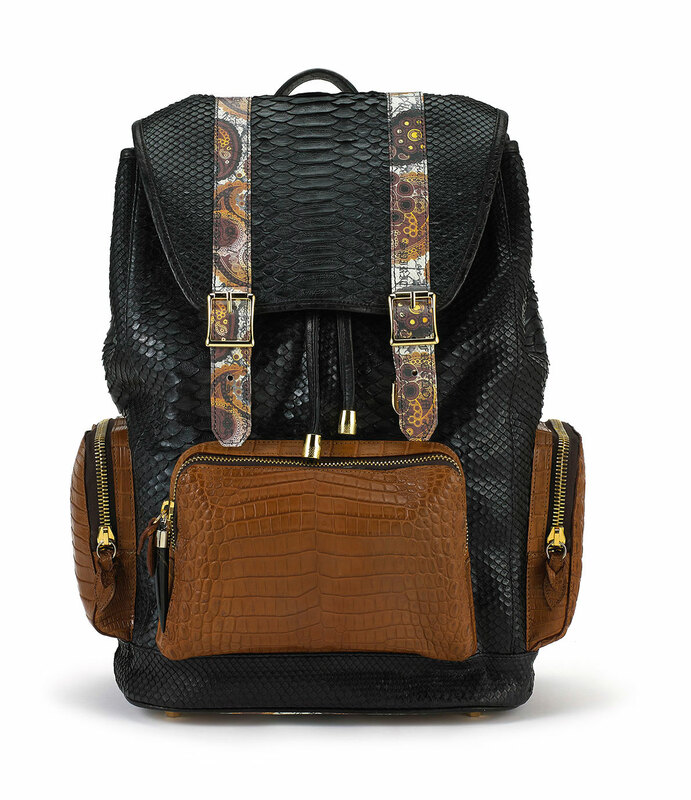 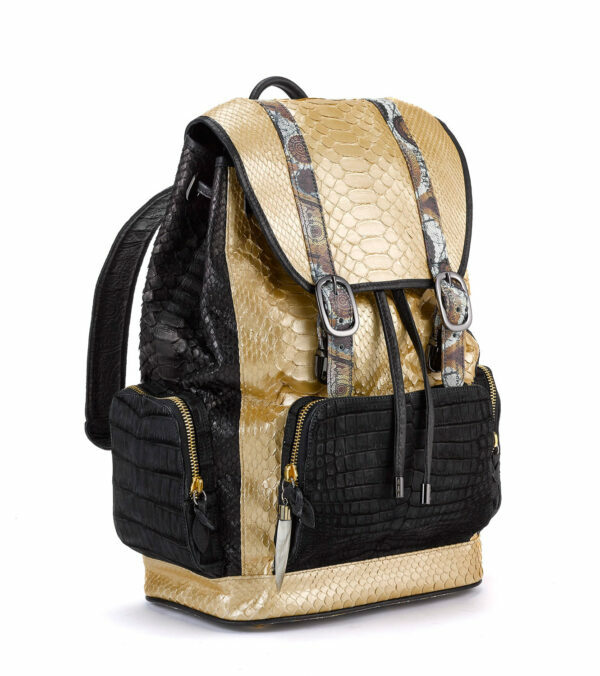 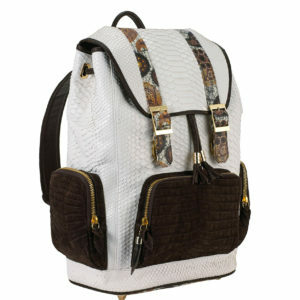 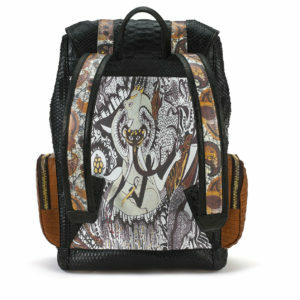 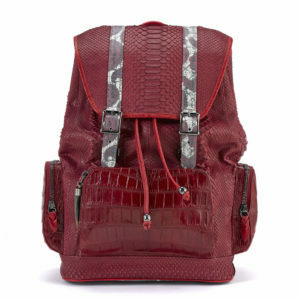 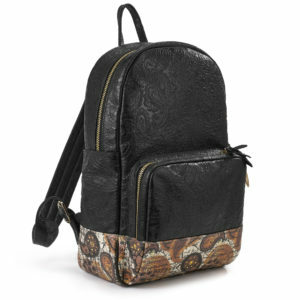 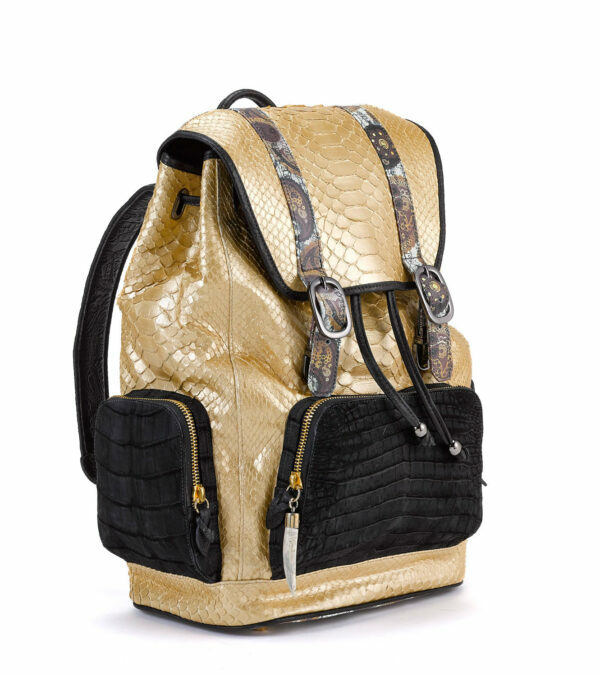 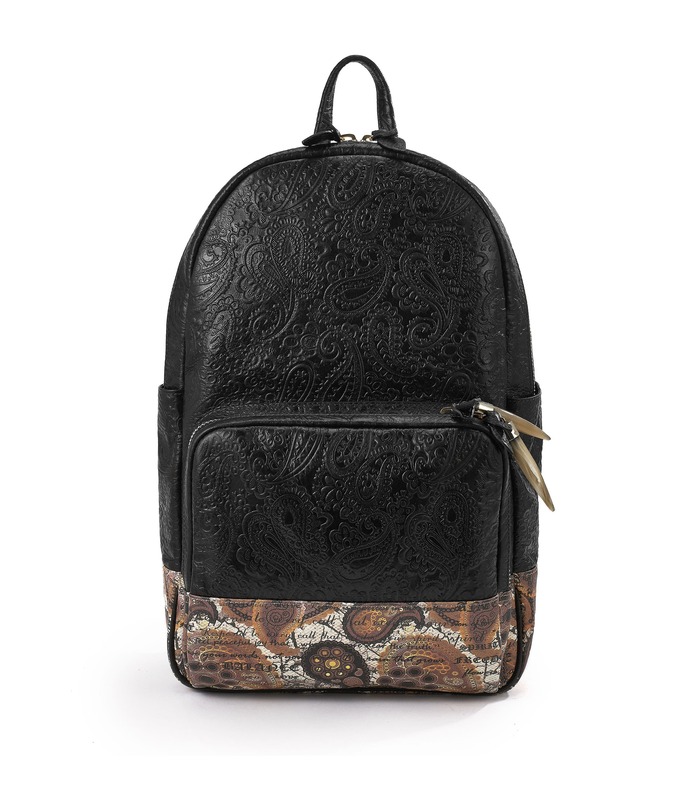 Materials: Genuine gold python & black crocodile pockets, Lampo zippers, Gunmetal and gold tone hardware. 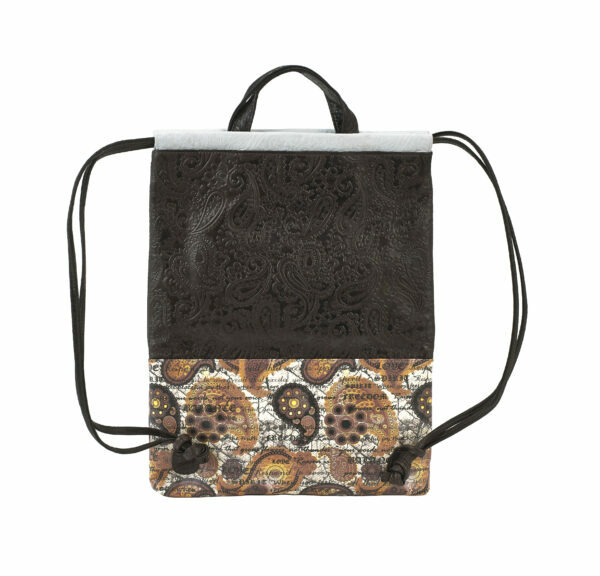 Interior: genuine suede, two interior pockets, zippered pocket, key holder, laptop pocket. 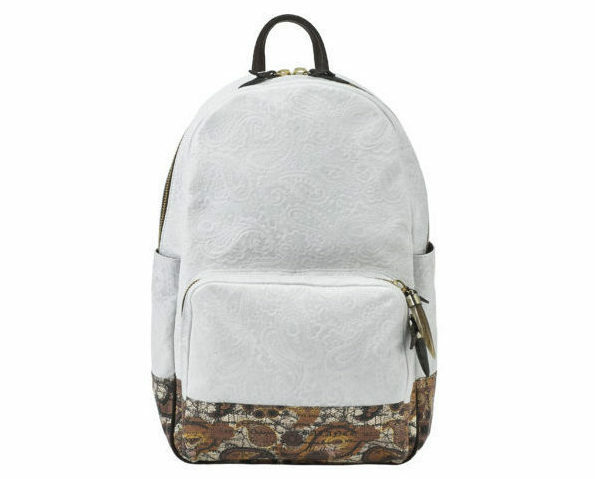 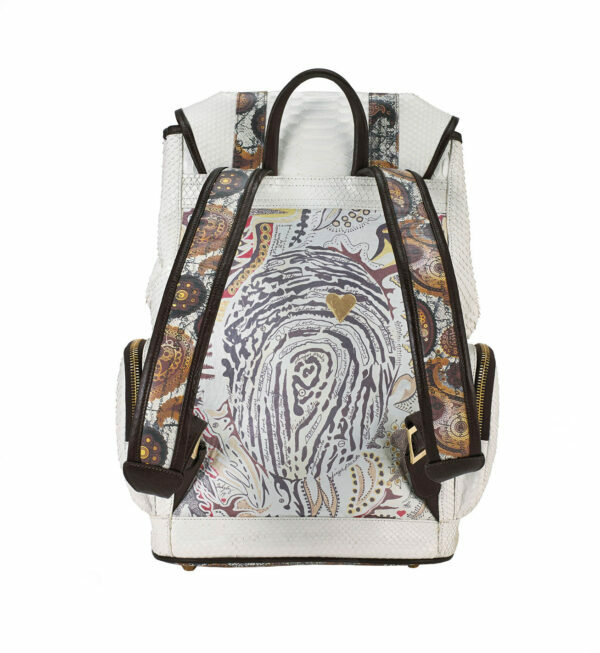 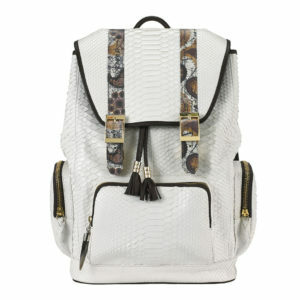 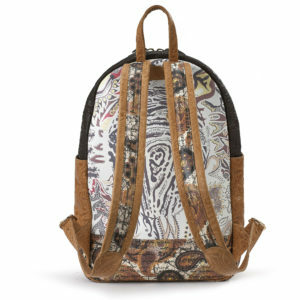 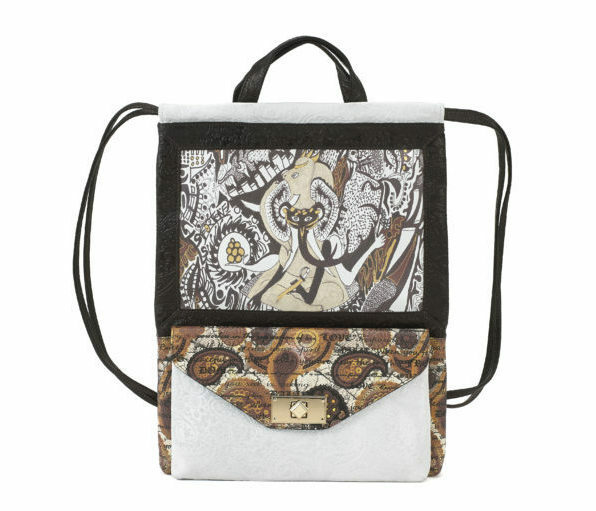 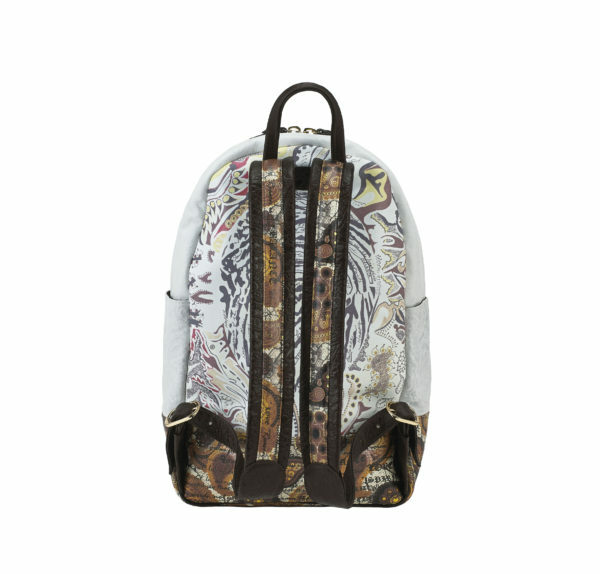 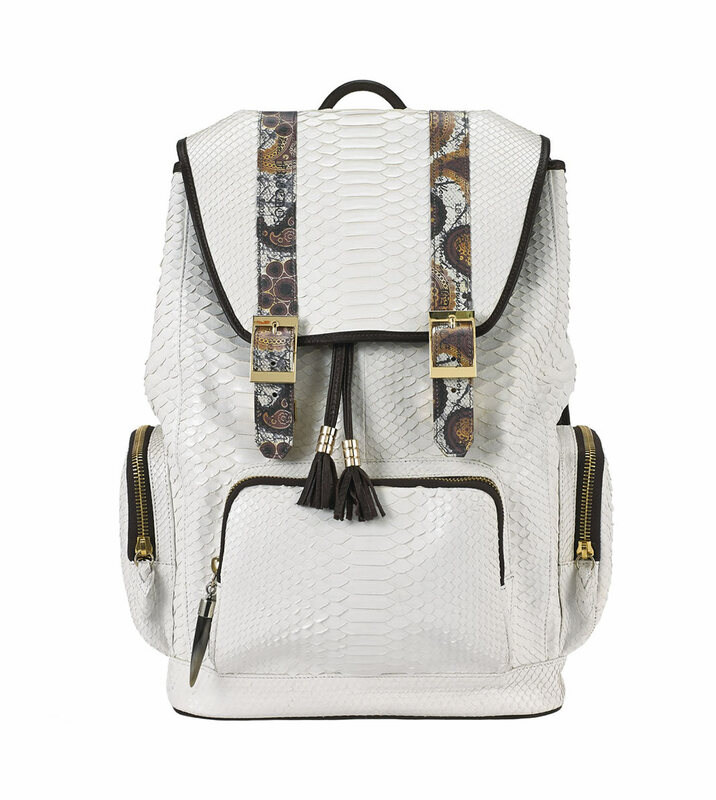 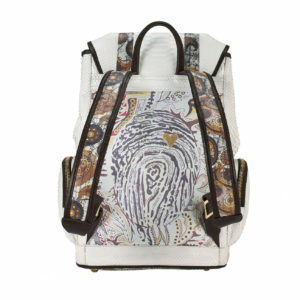 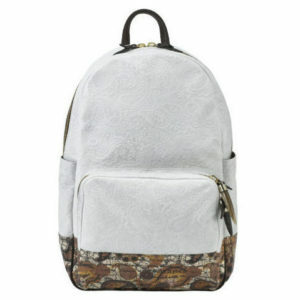 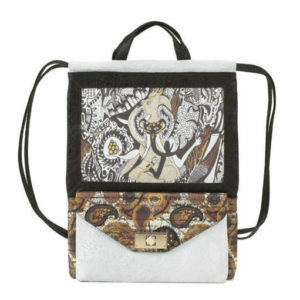 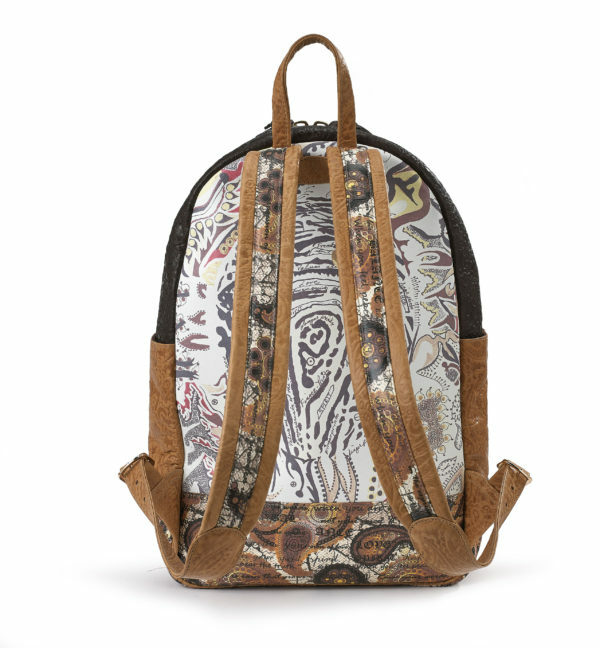 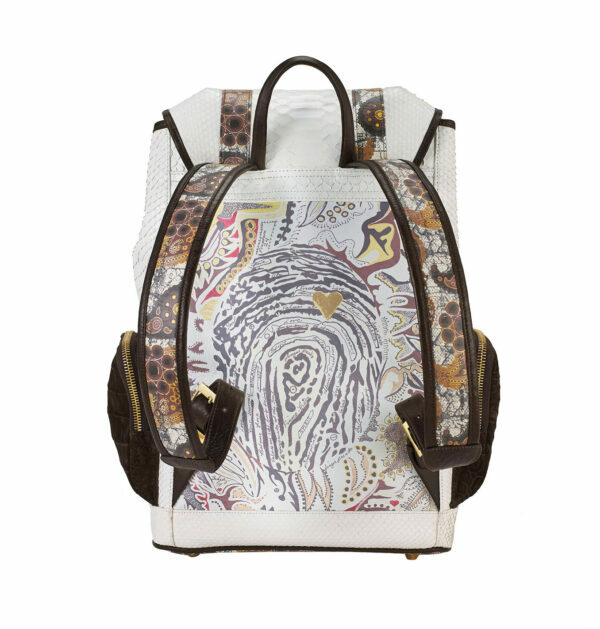 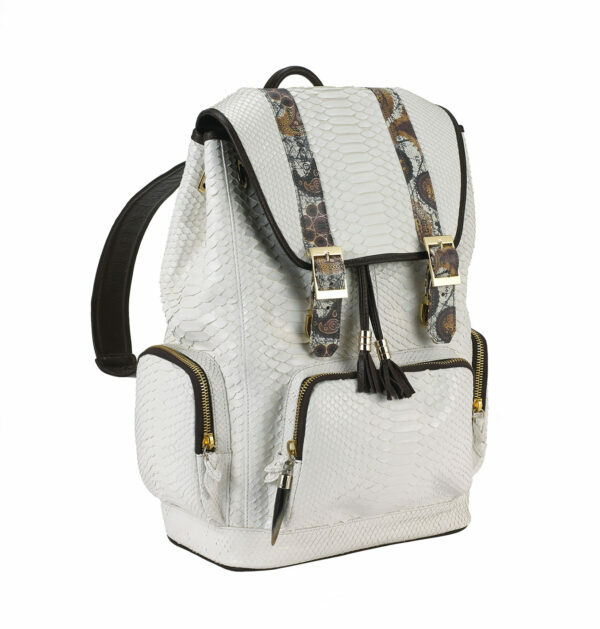 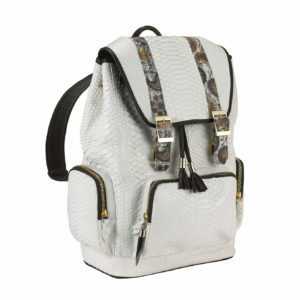 Materials: White exotic python, trimmed with embossed paisley leather straps, genuine suede interior, lampo zippers, mini horn pull, two open interior pockets, one interior zippered pocket, key holder, tablet compartment holder, gold tone hardware. 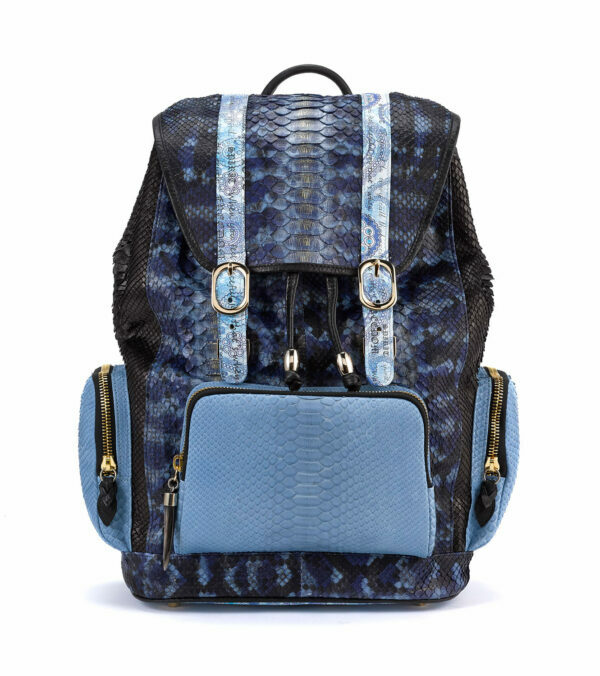 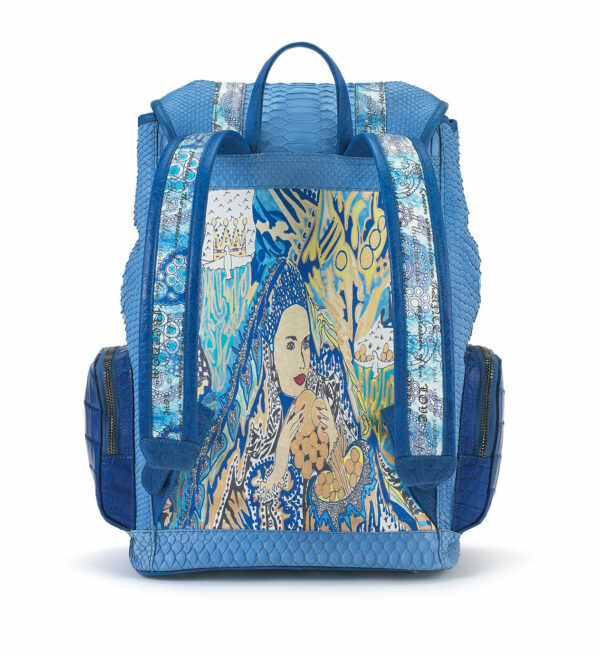 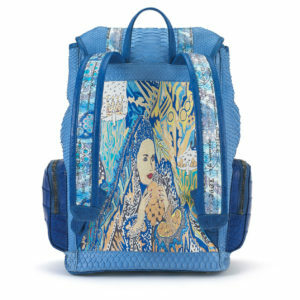 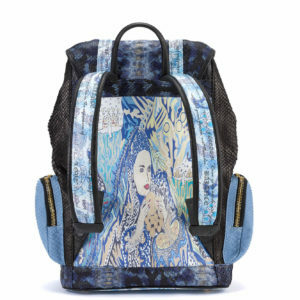 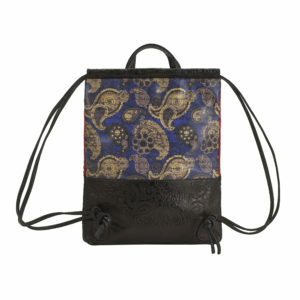 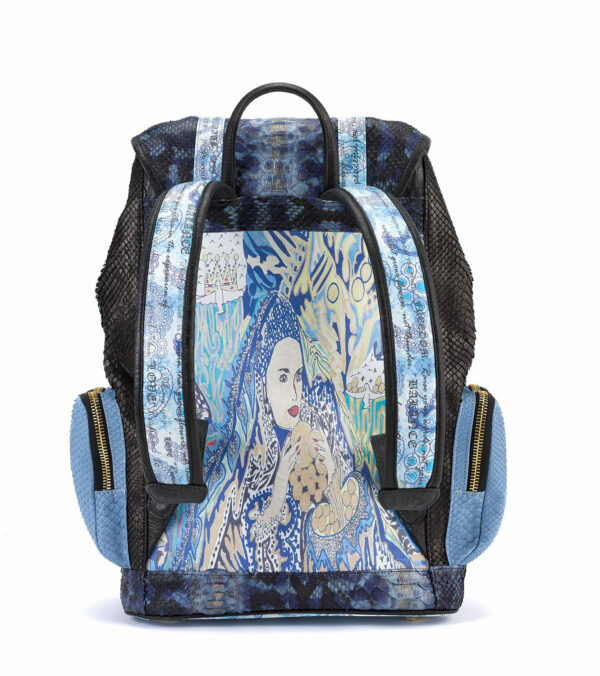 Materials: Exotic blue python skin exterior, blue embossed paisley leather pockets, lampo zippers, genuine suede interior, interior, two open pockets, one zippered pocket, tablet compartment, key holder, mini horn pull, gold tone hardware. 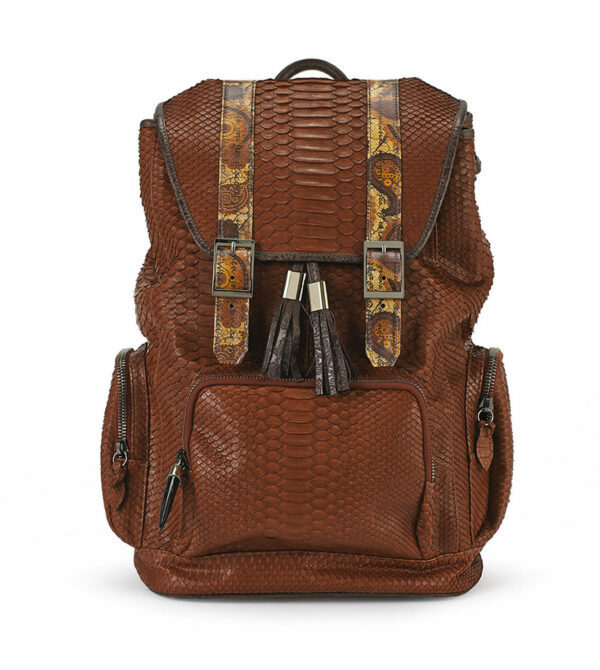 Materials: Exotic cognac python exterior, lampo zippers interior genuine suede, key holder, tablet compartment, open pockets, zippered pocket, mini horn pull, gun metal hardware. 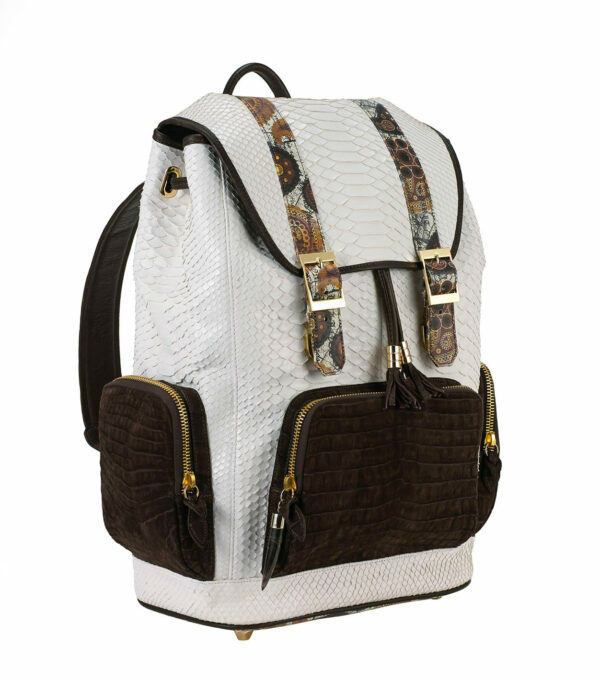 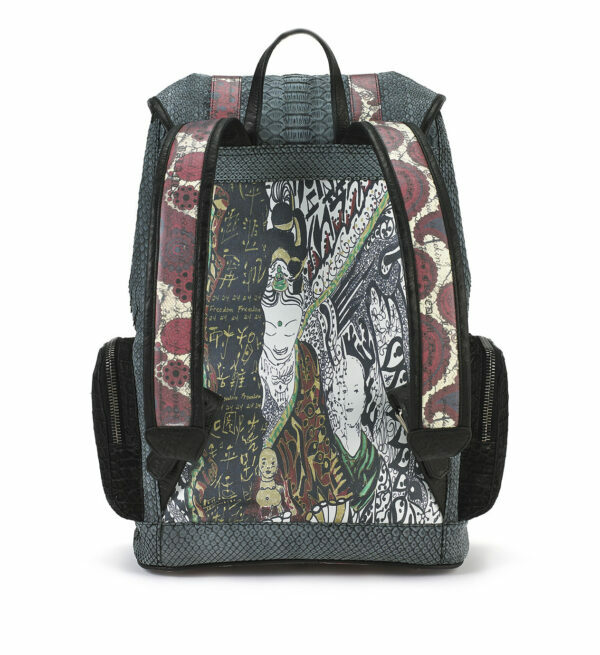 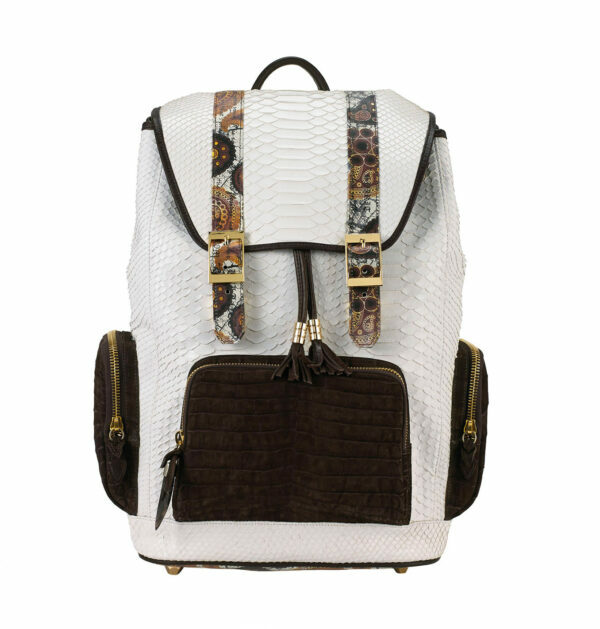 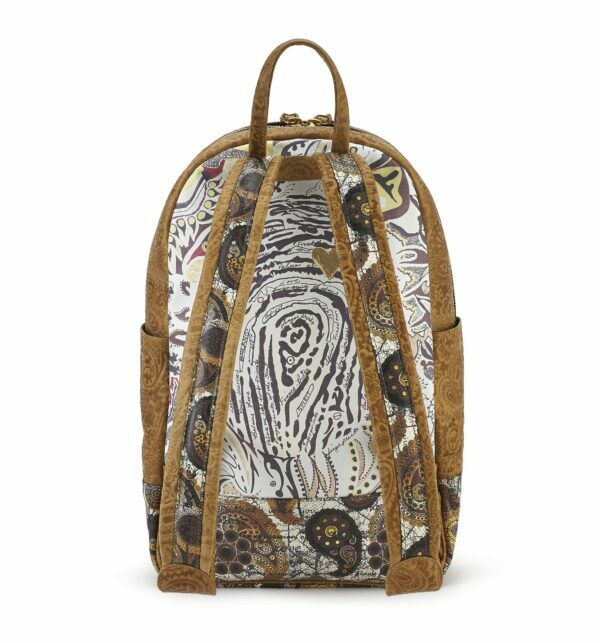 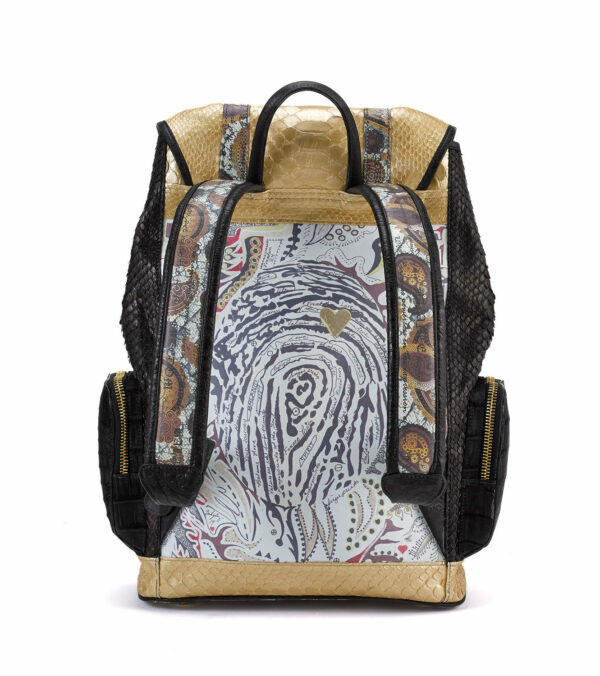 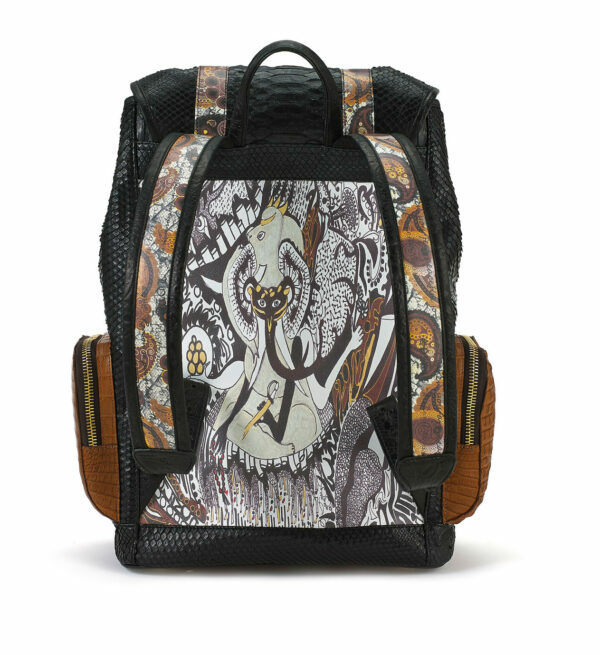 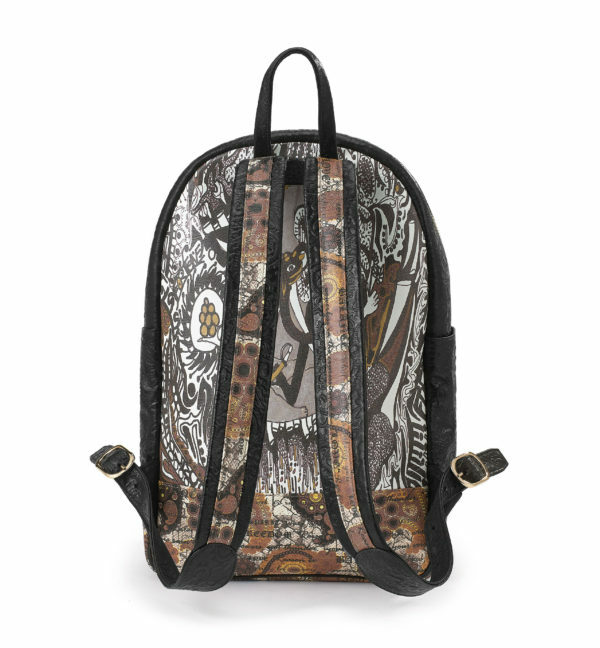 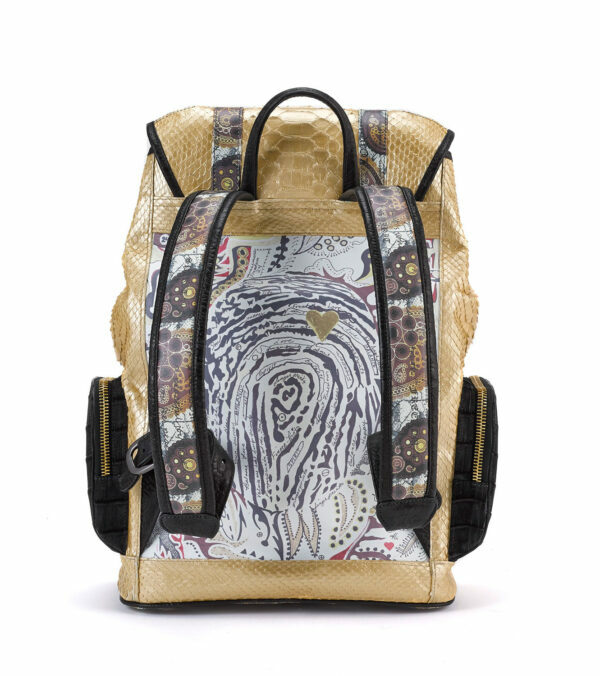 Materials: Exotic white python, trimmed with embossed paisley leather straps, genuine suede interior, lampo zippers, mini horn pull, two open interior pockets, one interior zippered pocket, key holder, tablet compartment holder, gold tone hardware.